A thick and dangerous blanket of smog is currently enveloping Beijing and parts of Eastern China, forcing authorities to issue an “orange” alert—the second highest level of a four-tiered pollution scale. Here’s what it looks like from space. The timing couldn’t be worse for China, as the COP21 Climate Change conference starts this week. The pollution, the most severe of the year, is forcing people to stay indoors, put a halt to construction, and shut down factories. 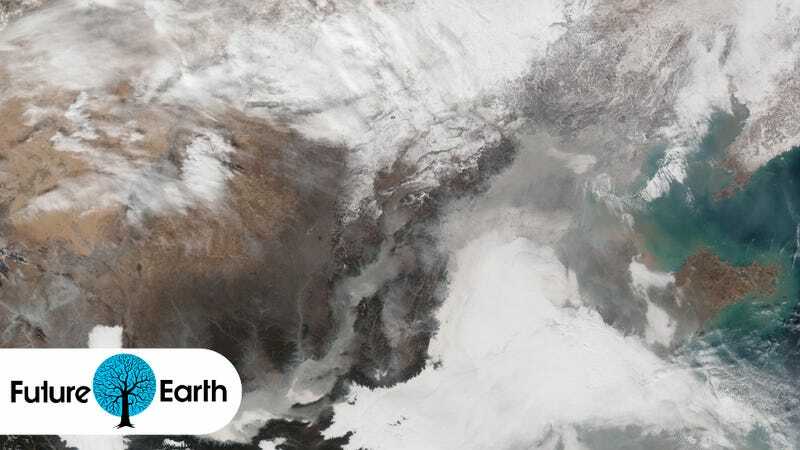 The Visible Infrared Imaging Radiometer Suite (VIIRS) on the Suomi NPP satellite acquired this natural-color image of northeastern China on November 30, 2015. The image shows extensive haze, low clouds, and fog over the region. The brightest areas are clouds or fog, which have tinges of gray or yellow because of the air pollution. Other cloud-free areas have a pall of gray haze that mostly blots out the cities below. In areas where the ground is visible, some of the landscape is covered with snow. The haze extended southwest from Beijing for hundreds of kilometers and was particularly dense in low-lying areas in the Guanzhong Plain. Here are some close-ups of the stricken areas. NASA says that many of the particles in the haze are sulfate aerosols, which are produced by burning coal. What’s more, coal fires, in addition to releasing CO2, emit sulfur dioxide, which intermingles with water vapor in the atmosphere. Together, this creates small droplets and crystals of sulfuric acid, along with other sulfates. Given that China uses coal to supply two-thirds of its energy, this smog should hardly come as a surprise. More at NASA’s Earth Observatory. Email the author at george@gizmodo.com and follow him at @dvorsky. Top image by NASA Earth Observatory image by Jesse Allen, using VIIRS data from the Suomi National Polar-orbiting Partnership. Suomi NPP is the result of a partnership between NASA, the National Oceanic and Atmospheric Administration, and the Department of Defense.